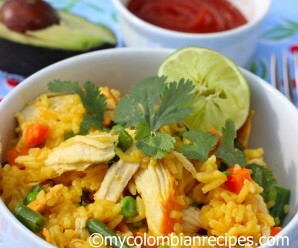 What’s there not to love about Pollo Frito? I know I love it! But for some reason, I have always been a little afraid to make fried chicken at home. I just didn’t think I would be able to get it just right. This week, I was craving some fried chicken from Frisby, a fast-food franchise in Colombia that specializes in Pollo Frito (Fried Chicken). I love to go there when I am visiting Colombia and order their wonderful crispy chicken drizzled with honey. And you wouldn’t believe all of the wonderful sides that they offer… small fried arepas, rice, salted potatoes, corn on the cob, baked plantain filled with guava and cheese, fried yuca, potato salad, coleslaw and their fantastic beans. You can’t leave the place without eating their delicious esponjados! Here is the recipe for my first ever homemade fried chicken. It was crispy on the outside and moist on the inside. Just perfect! Rinse the chicken with cold water and pat dry with paper towels. In a small bowl, combine salt, black pepper, cumin, mustard and paprika. Rub the mixture onto the chicken. Place in a large baking dish, cover with plastic wrap, and refrigerate for at least 5 hours or overnight. In a 6-quart deep sauté pan over medium-high heat, heat the oil to 375F on a deep-frying thermometer. Preheat an oven to 200°F. Line a baking sheet with paper towels. o make the batter: In a bowl, combine the flour, milk, salt, paprika, cumin, black pepper and eggs and mix well. Dip the chicken into the batter. Place the bread crumbs on a plate. Dredge the chicken in the bread crumbs, shaking off the excess and set on a plate. Place half of the chicken pieces in the oil and fry, turning often and maintaining the oil temperature at 325°to 350°F, 14 to 16 minutes. Transfer to a baking sheet and keep warm in the oven. Repeat with the remaining chicken. Transfer the chicken to a serving plate, drizzle with lime juice and honey. Serve with your favorite sides. honey and limes? now that is a secret worth sharing – thanks I cant wait to try this! 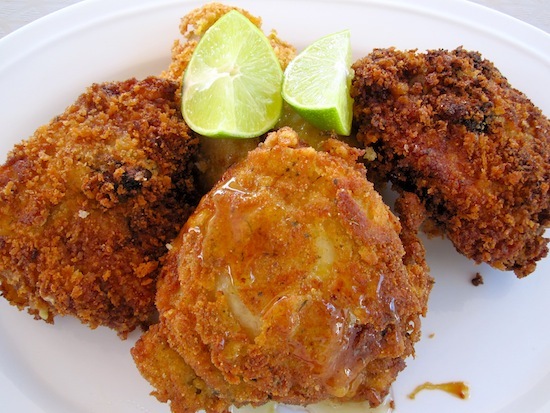 The spices in the batter sound great, and the drizzled honey and lime make it look amazing! 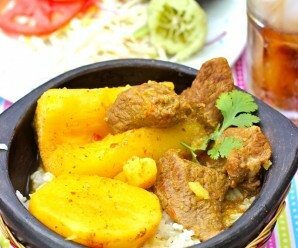 I’d love to try it with a baked plantain filled with guava and cheese. Got a baked plantain recipe? I’d really love it! This looks delicious! !I love the sides you mention too. Have a great weekend. Your first ever attempt at fried chicken looks like it was a huge success, Erica! I love that you drizzled the honey on it. I’ll have to try that sometime! Honey on the fried chicken? Interesting! Your chicken looks perfectly cruchy. Love the use of the cumin and limes. That I’ll have to try next time I fry chicken. Though not a fan of honey on my fried chicken, which is huge in the southern US. What’s not to like…is this a trick question? That looks delicious! My husband loves fried chicken, I’m sure he would love this!! Oh wow, the drizzle of honey sounds absolutely amazing on this chicken! My hubby would go nuts for this! I’ve been craving fried chicken and these photos have just sent me over the edge. The next time I am hold in the evening I know what I’m making. Thanks for sharing this special recipe. This sounds so delicious and I may make some for my children who would love this (not that I wouldn’t but I’ve stopped eating anything fried). frisby is a great name for a restaurant chain–i like it! i think the homemade version (yours in particular) is far superior to anything you can get at a fast food establishment–impressive debut! Good work on your first-ever fried chicken, Erica! You did a super job. 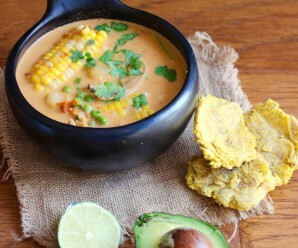 I love the cumin in the batter and the honey/lime drizzled over the top looks delicious! WHOA!!!!! Fried chicken with honey?! I had no idea there was such a combination, but now that you have mentioned it, it seems like it would be a match made in heaven! And to throw some lime in there?? Absolutely incredible. Thanks so much for the recipe – looking forward to trying it soon as we are having a picnic next weekend! Fear of frying chicken at home is very common. It’s nice to see you took the leap. 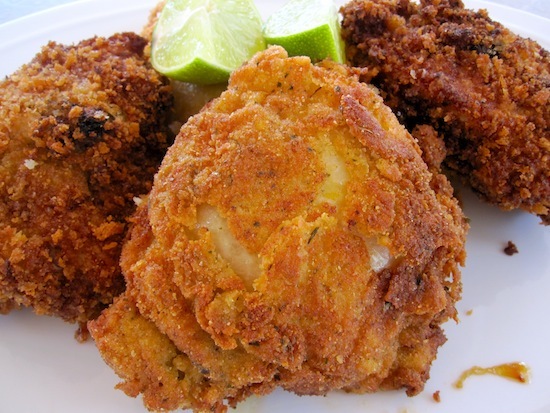 Wow, the fried chicken sure looks yummie, love the ingredients in the batter…nice pictures! Oh my goodness! Those fried chicken looks so scrumptious! Lovely photos! Why isn’t the fast food in the US this good? That batter sounds absolutely fantastic! 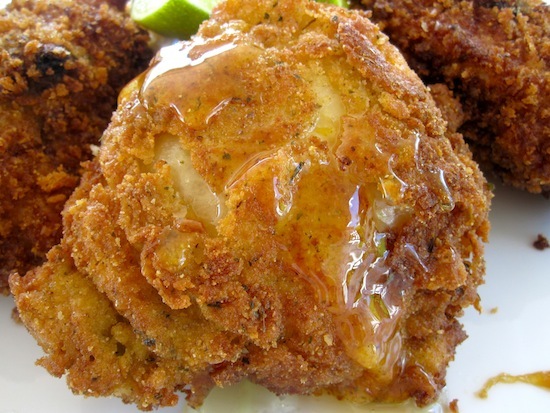 Wow and I thought I was the only person in the world that drizzled honey on their fried chicken! I love that you used cumin in your fried chicken. Colombia is pretty high on my list of countries to visit and I’ll definitely have to look for Frisby when I make it down there. Looks wonderful! Who cares if it is fried! I know I don’t , not with these spices on it! Thank you guys! I truly appreciate it! Hi Erica, Did you use yellow mustard on the marinade? Also what kind of bread crumbs do you use? 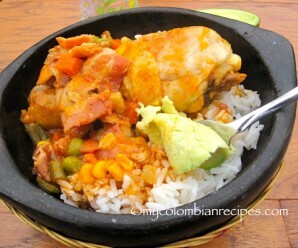 Making this dish tomorrow, I can’t wait to taste it, your recipies are awesome! Mabel- I used yellow mustard and plain bread crumbs. Do I have to let it sit 5 hours to overnight?